I can't get enough of the Sweet Summer collection. This week I decided to use it on all of my planners. 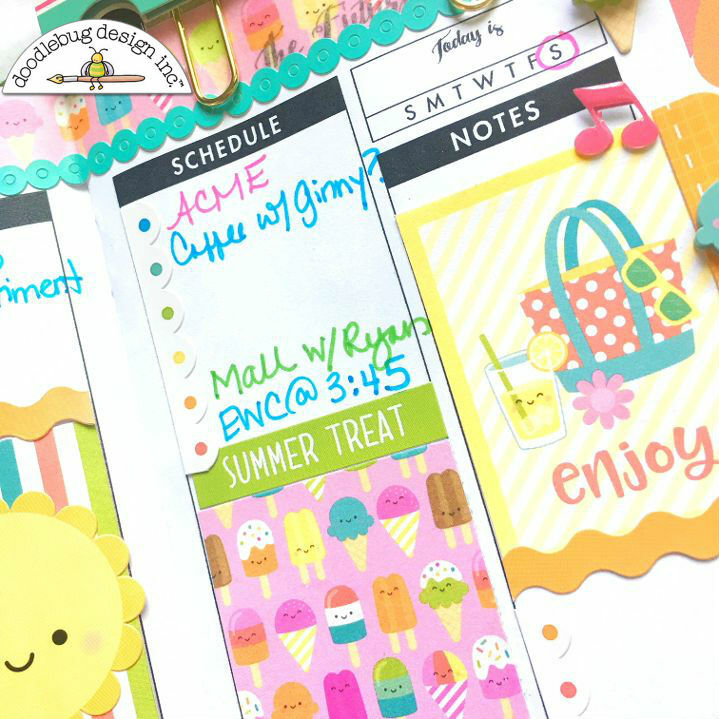 I thought I'd share how it looks on my daily, weekly and monthly planner inserts. Now, no matter what I'm planning, I'm sure to see the cute characters and motifs from the collection. First up is my Pocket sized planner. I have inserts that are daily. Here is a two day spread. I often use planner stickers with full boxes on these pages. Here, I decided to use the little boxes from the 6x6 paper from the paper pad. They worked perfectly. The 'enjoy' and 'relax' boxes are the ones I used. The other two boxes are patterned paper that I cut to fit. I added the sun to the striped one and a word sticker to the other. The washi and fancy frills made great borders. Here's a close up shot. I used the polka dot scalloped border to create a bulleted section on these pages. The border sticker worked perfectly for that. Next up is my monthly calendar. The collection is perfect for my June calendar. With summer starting, school ending and trips to the beach, it worked great! Do you see that green and white striped border on the right side of my calendar? It's actually the border from the mini- icon sticker page. (You can see the page on the left side of the photo.) I cut it off and used it. Looks just like washi! Finally, here is my weekly spread. 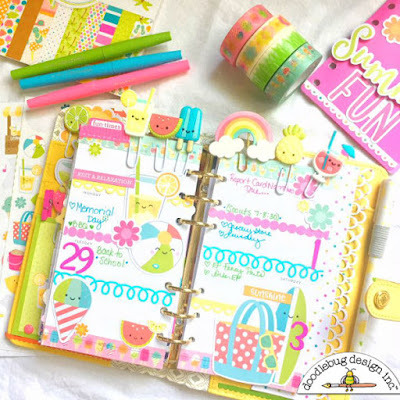 I used lots of the fun die cuts to give these pages some personality! I also used several of the fancy frills as borders. They are so versatile! The cute Jelly Clips topped of the spread perfectly. Are you ready for summer. 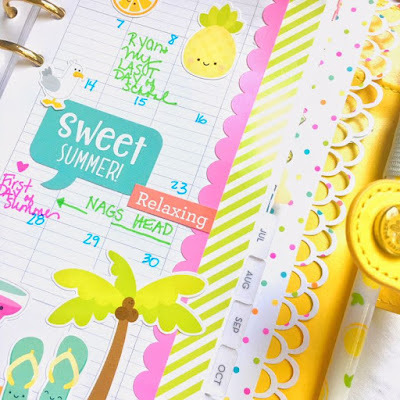 With the sweet summer collection, your planner certainly will be! 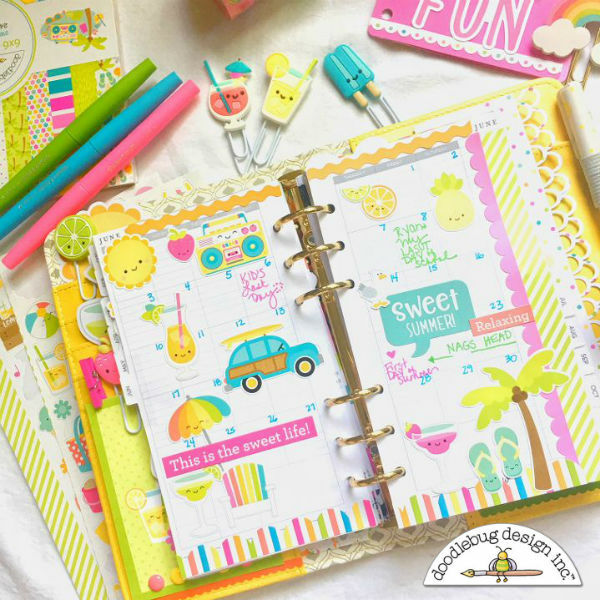 Such a bright and cheery planner! 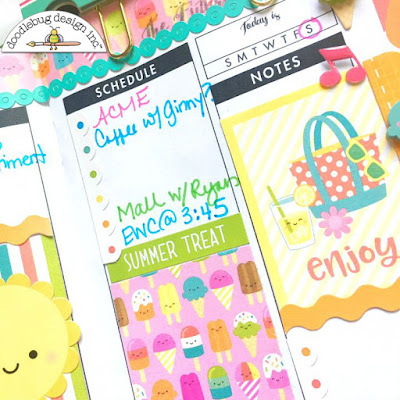 I have planner envy!